I’ve been told I put together a mean cheese platter. 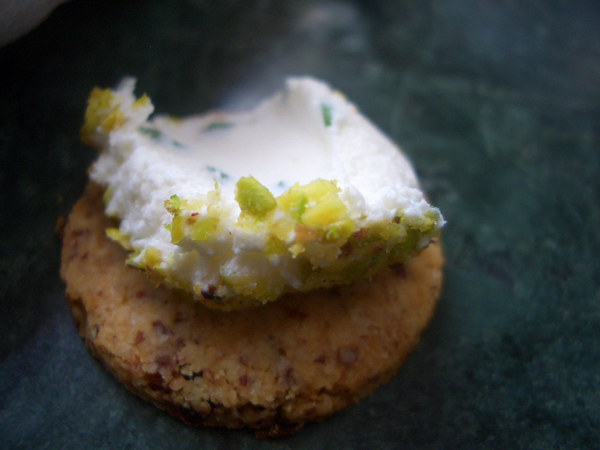 In addition to the rich triple creams and heavy blues I almost always throw in a log of goat cheese rolled in fresh chopped parsley for something a little lighter to break things up. Then I saw the recipe for Pistachio Dusted Goat Cheese Pears in The Cheesemonger’s Kitchen by Chester Hastings, and it got me thinking about how much more could be done with the humble log of goat cheese… I used yogurt cheese made by straining good quality Greek yogurt for two days in the refrigerator. I also added herbs and other flavorings to the nut coating and the cheese to give things little more pizzazz. These are fairly small, about 2-1/2 inches (6.35cm). They are best served soon after they are made. They can be left at room temperature for several hours in a cool environment. If you put them in the refrigerator for a longer period of time, the nuts will start to lose their luster and get dark, damp and soft. 2 Tbsp. (30ml) nuts–I used walnuts for the pear and pistachios for the apple. You could use almonds, pecans, hazelnuts. I chop my nuts and lightly toast them in a skillet on low heat for about 10 minutes watching closely to make sure they don’t burn. Flavorings for the cheese and the nuts–fresh thyme, mint, tarragon, orange or lemon zest, minced dried fruits like cranberries, cherries, apricots, dried spices like sweet or smoked paprika, curry powder, pink peppercorns. Any of these flavorings could be used inside or out. Decoration–I used oregano for the little leaves on top. You could use mint, tarragon, chives, basil. I would stay away from bay because they’re a choking hazard. For the pear I used walnuts, 1 teaspoon (5ml) lemon zest, 1/2 teaspoon (2.5ml) fresh minced thyme, pinch of salt and fresh black pepper. I left the cheese plain. 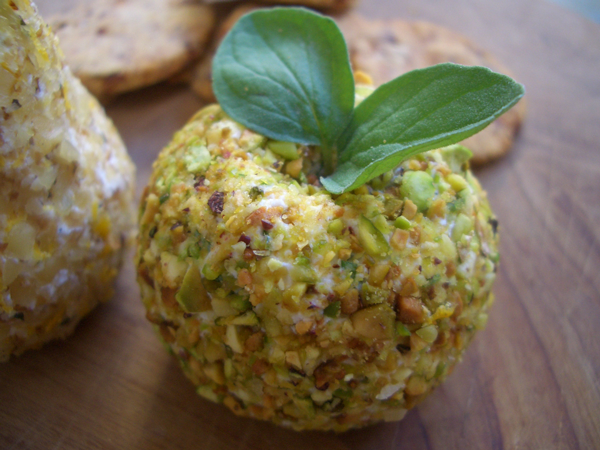 For the apple I used pistachios and folded 1 tablespoon (15ml) of fresh minced chives into the cheese. Using your washed and impeccably clean hands… Add the herbs etc. to the cheese. Roll the cheese into a ball. Roll the ball in the chopped nuts flavored (or not) with herbs, etc. 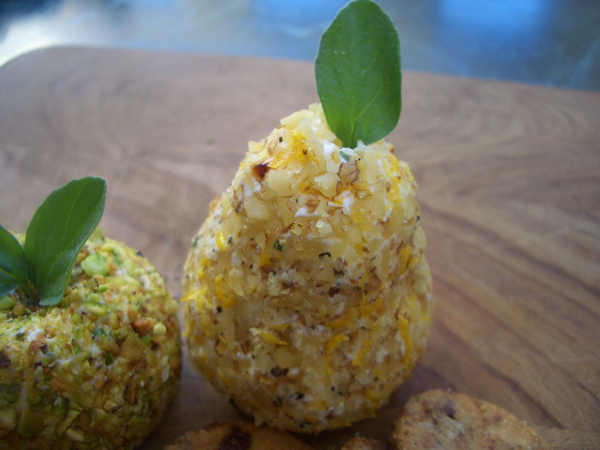 Gently form the nut-covered ball into the shape you want. I found it easier to do it this way as opposed to trying to form the shape with the cheese alone. Use a toothpick or tip of a knife to make an indentation in the top. Use the same to press the stem of the leaf into the indentation.